Before the RGB madness took over the PC industry, we were used to using PC fans without any RGB lighting or single static color lighting on them. The only difference was that many fans had white color blades instead of going all blackout. Of course, Noctua has been the exception to all this until now with their Chromax line up of fans (non LEDs). 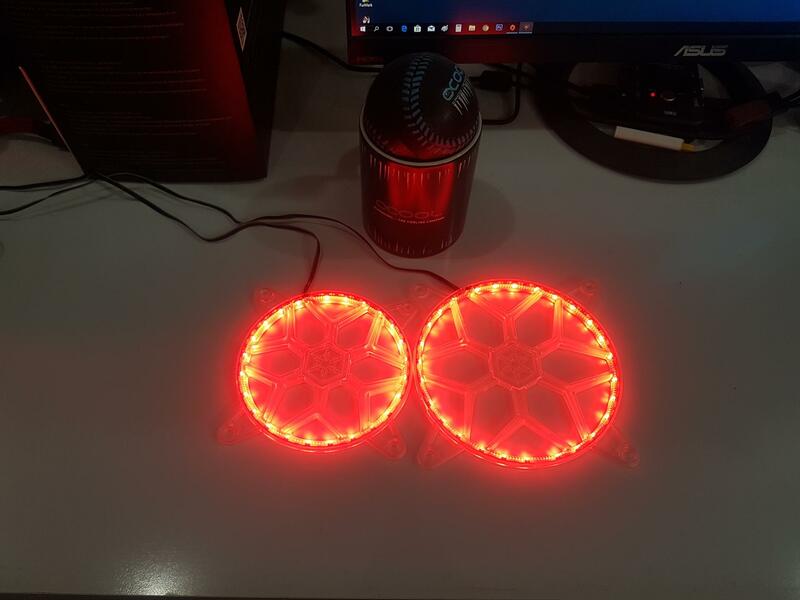 With RGB fans making their way into the market, they quickly drew users’ attention and trend quickly followed leading to RGB lighting of the major components. 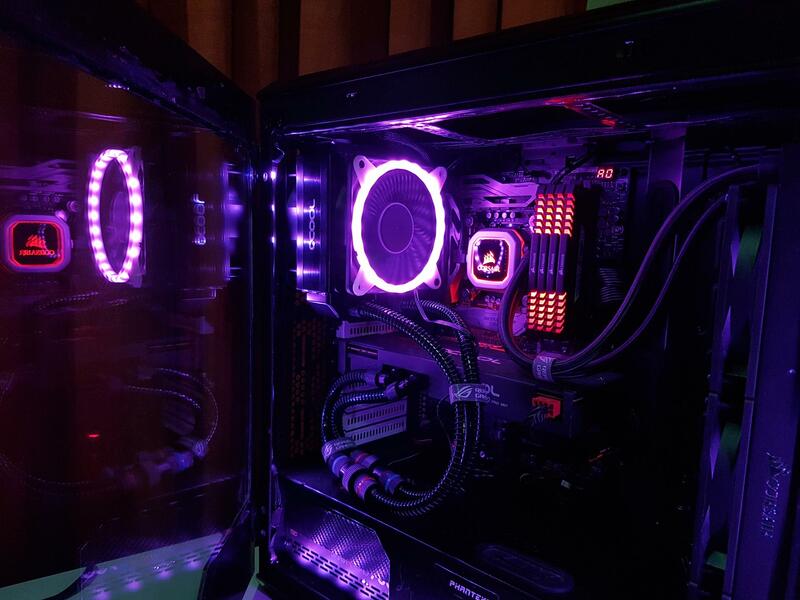 This equally presents challenges to the users who were using non-RGB version of the fans. 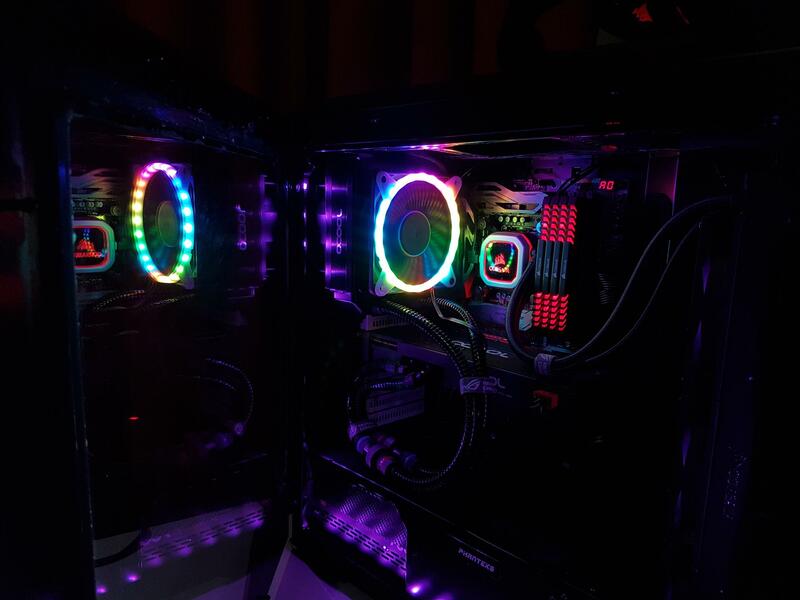 Companies were quick to customize their RGB accessories and offer solutions for non-RGB version of fans. 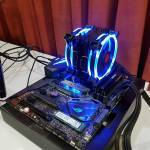 Phanteks introduced the Halo RGB fan frames and they were met with the success. 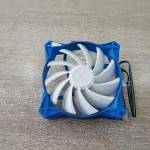 SilverStone Technology also introduced the FG121 and FG141 fan accessories. 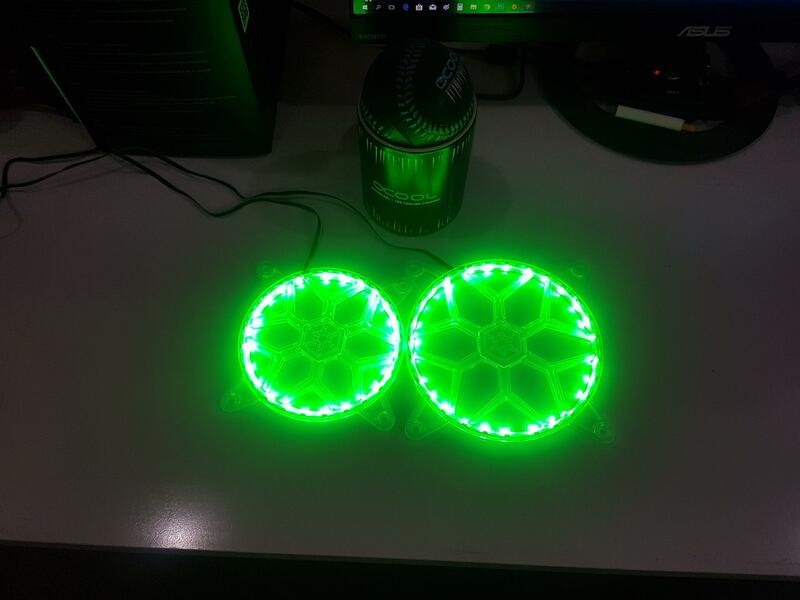 These are RGB grilles for the 120mm and 140mm fans respectively with stunning design and of course RGB lighting. 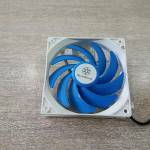 Recently, the company has introduced their FG122 and FG142 addressable RGB fan frames. As the name indicates the later products are not grilles but the frames and they come with digital or addressable RGB lighting solution. 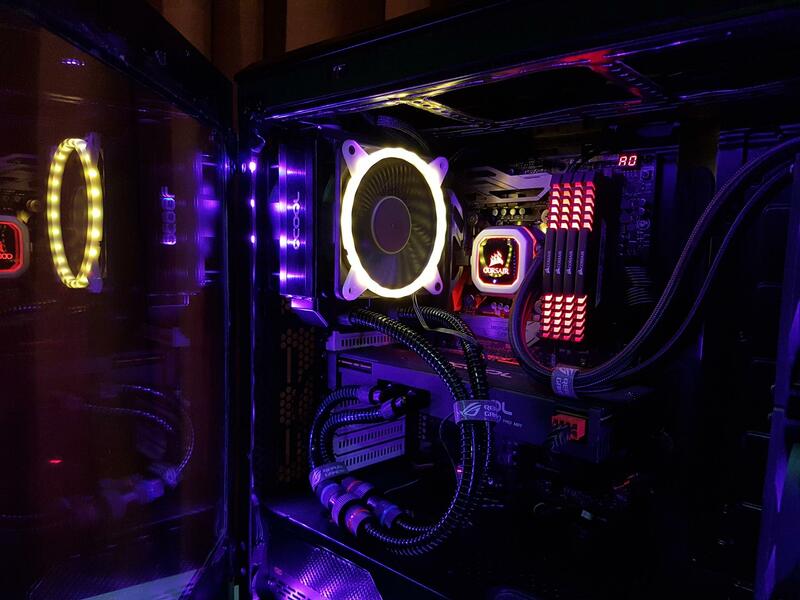 All types are compatible with the RGB lighting headers on a majority of the motherboards from various manufacturers like Aura sync from Asus, Mystic Lighting from MSI, RGB Fusion from Gigabyte to name a few. Silver Stone Technology has sent us their grills and frames to be reviewed. The FG121, FG141, FG122, and FG-142 come in a large size transparent container packing. There is a hard paper packing inside each box. The front side has a SilverStone brand logo and name printed in the white color on the top left side. RGB logo of the SilverStone is printed on the top right side. The main section has a see-through area with the visible product. There is a raised area on the bottom of the product. This area has a picture of the grilles in 7 different colors for the FG121 and FG141. 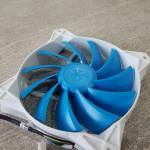 120mm/140mm RGB fan grille is printed for the FG121 and FG141. Salient features of the product are printed on the bottom of the FG121/FG141 boxes. Product models are printed on the bottom right side for the FG121/FG141 along with the website address of the manufacturers. The raised surface on the FG122/FG142 has the text “integrated 24 pcs RGB LEDs strip for brilliant light effects” is printed. Model no of the product is printed on the bottom left side for the FG122/FG142 with the website address on the bottom right side. 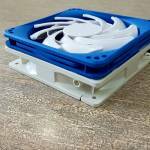 The FG122/Fg142 has 120mm/140mm Addressable RGB Fan Frame printed in the middle of the box. The backside of the FG121/FG141 has the support contact info on the top left side. There is a picture of the grilles in 7 different colors on the main section followed by the specifications of the product. UPC, EAN stickers are printed on the bottom side along with the pasted serial no sticker on the right side. The backside of the FG122/FG142 has company’s support contact info printed on the top left side. Special features of the products are printed in 11 different languages. Specifications are printed on the right side under the pictures of the frame in multiple colors. The EAN and UPC stickers are printed on the bottom right side. The serial no sticker is pasted on the right side. Products are made in China. The RGB logo of the SilverStone is printed on the bottom right side. 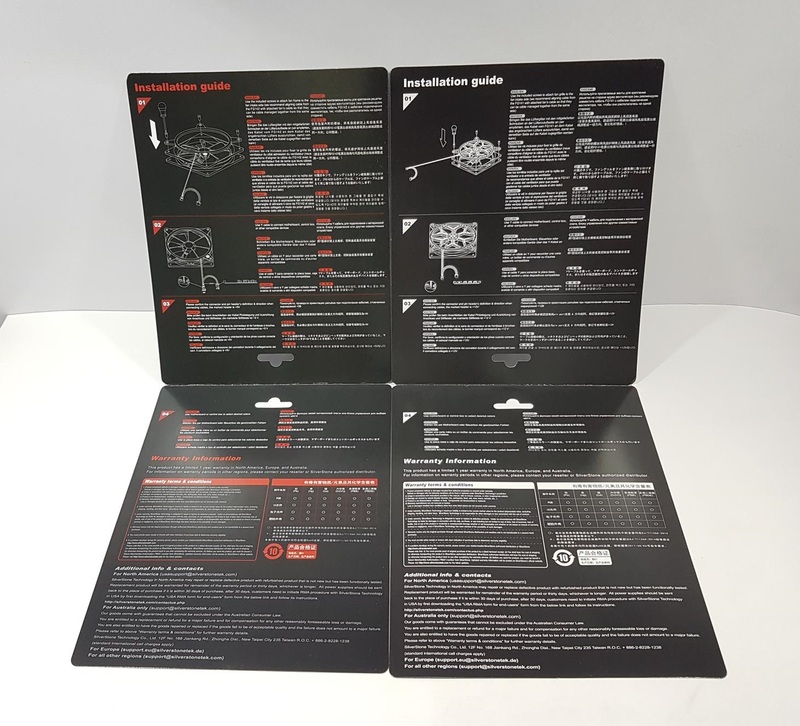 Installation guide is printed on the inner side of the hard paper of the FG121/FG141 in 10 different languages. FG121/FG141 are rated +12V DC and has 4 pin connectors. Pin definition and direction must be compatible with the connecting device. Warranty information is also printed on this side. Warranty varies from region to region so ask the seller for the regional warranty information. A 1-year warranty is being offered for the regions of North America, Europe, and Australia. Company’s contact info for various regions is printed on the bottom. Same patterns follow for the FG122/FG142. These are +5V DC and have 3-pin format. Pin definition and direction must be compatible with the connecting device. Each pack has a fan frame/grille and 4x black color screws. Let’s start taking a closer look at the FG121 and FG141. These are essentially the fan grilles not the frames so, don’t confuse them with the frame. 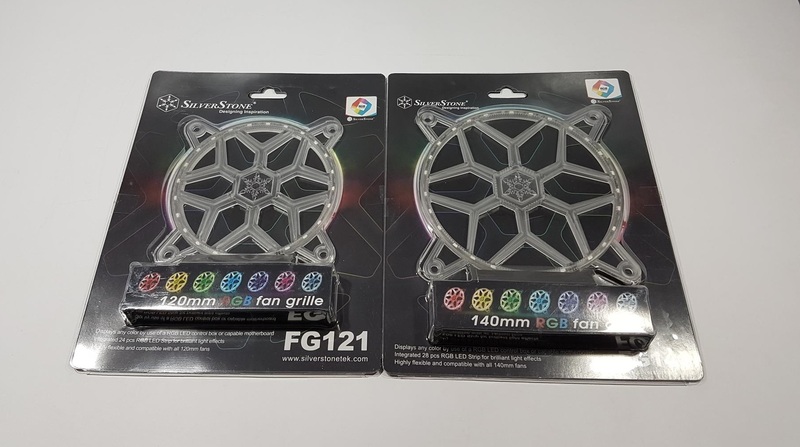 Here is what the SilverStone Technology has to say about them, “To meet the rising demand from enthusiasts with a keen sense of style and expressive personality, SilverStone created the FG121, a 120mm fan grille with 24 integrated RGB LEDs. This brilliant kit can be controlled by hardware or software that can manipulate +12V, G, R, B, signals such as RGB LED control box or motherboard. 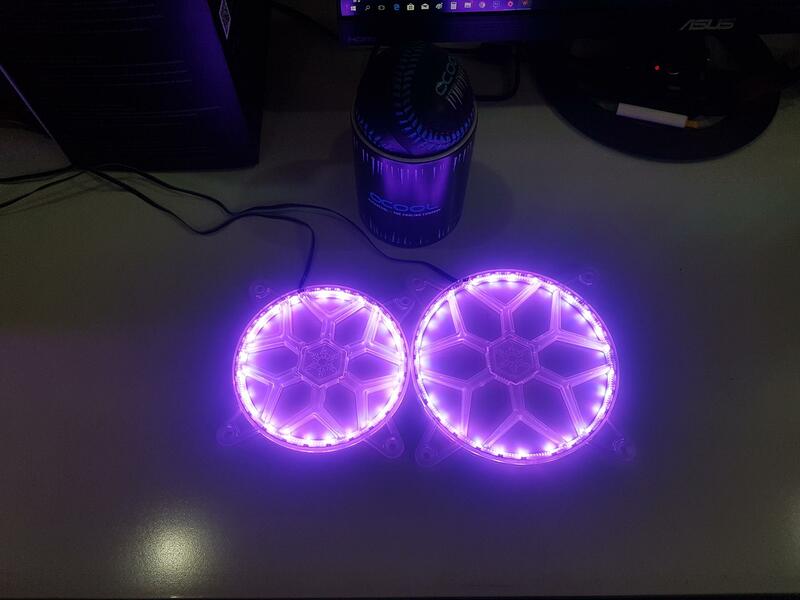 With the FG121, any 120mm fan or fan mount can be turned into an RGB display source so users can freely choose the exact fan they want to use without being constrained by the limited number of RGB fan models.” Each kit is essentially a grille with an LED strip inside it. They carry a bold, stunning, aggressive design which emblems the SilverStone Technology’s brand logo. The grille is made of a single piece of the plastic material and has a dimension of 120mm (W) x 120mm (H) x 6mm for the FG121 and (D) / 140mm (W) x 140mm (H) x 6mm (D) for the FG141. The plastic body is a see-through type. The center is in a hexagonal shape and has a SilverStone Technology’s brand logo carved on it from the underside. The central portion is connected to the main frame using Y shape elements in an exquisite design. There are total 6 of these Y shape designs. Each corner mount is in the shape of letter A with a rounded tip. The mounting holes are not threaded. Screws would simply pass through these to be screwed inside the fan’s threaded holes. The backside of the grille shows that the Y shape elements are hollow from this side. This approach is also followed for the central portion and sits in the perfect symmetry with the overall design. 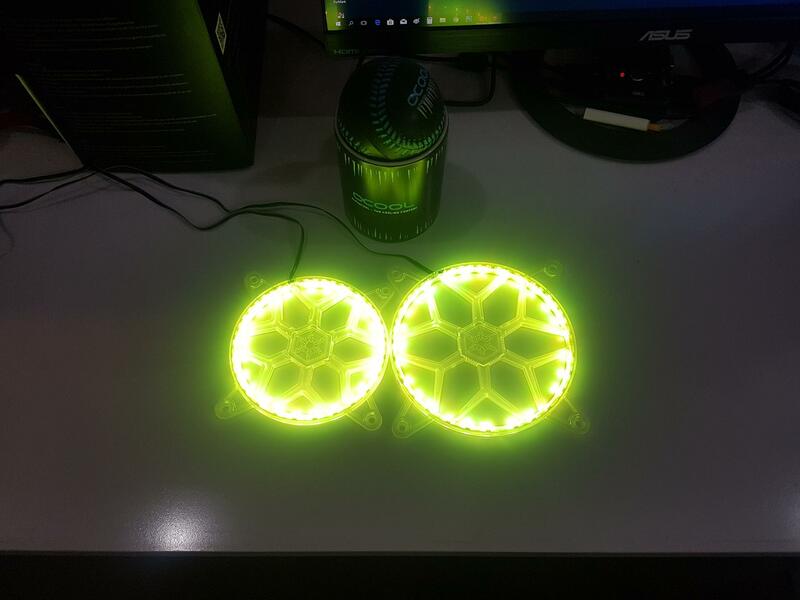 There is a 24 pcs RGB LED strip placed vertically inside the two layers on the border of the frame. The LED strip is covered on its bottom side with the transparent cover. On the bottom, a 4-pin flat cable is coming out of the frame’s opening. The cable’s length is 480mm + 103mm. These grilles take +12VDC voltage and are rated at 0.48A for the FG121 and 0.56A for the FG141 making the input power of 5.76W for the FG121 and 6.72W for the FG141. These grilles are following the +12V, G, R, B pin definition. They are compatible with the SilverStone Technology’s LSB01 RGB LED Hub as that hub follows the same pin definition. We have reviewed that hub earlier. 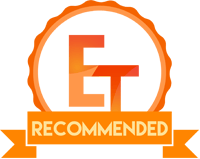 Click here to read its review. It is important to follow the pin definition so that grilles can be used only with the compatible devices and motherboard lighting headers. 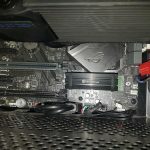 We have tested the grilles on the SilverStone Technology’s LSB01 hub that was also connected to the Asus Maximum X Hero motherboard. This board has two +12V, G, R, B Aura headers and a +5V, D, NP, G addressable Aura header. Make sure to check for the arrow symbol on the 4-pin connector cable as the side with the arrow symbol goes into the +12V pin of the header. 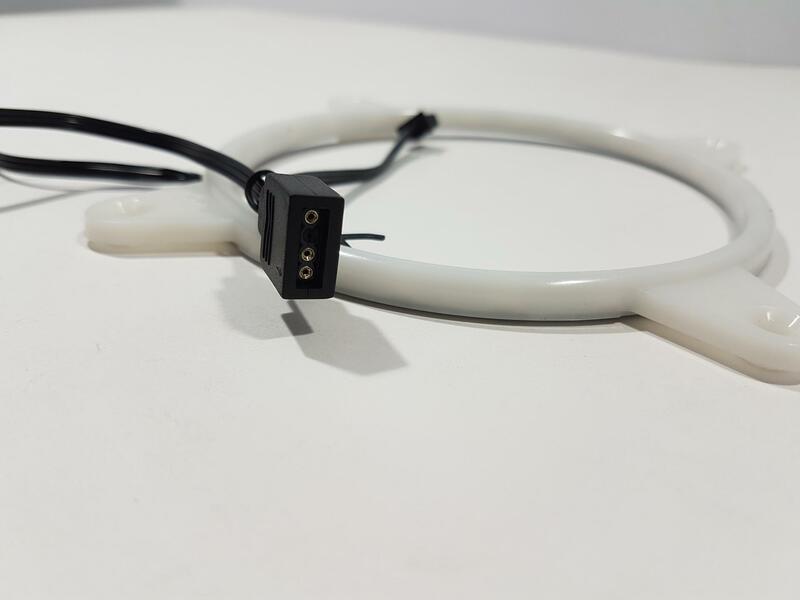 As the user would be dealing with one more cable besides the fan’s power cable, it is suggested to mount the grille such that the cable of the grille aligns with the cable of the fan as it would be helpful in the cable management. Overall, build quality of the FG121 and FG141 is good and there was no flex in the frame. 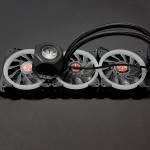 We have tested the grilles on the Alphacool Eiswolf cooling the Nvidia GeForce GTX 1080 FE to see if they restrict airflow and by what extent. The maximum temperature while playing BattleField 1 on the 4k resolution at Ultra settings without the grilles were 55°C whereas they were 55.5°C with the grilles. This is marginal and we can say that these grilles don’t restrict the airflow. Here is the demo video of the FG141 and a few pics as well for you eye pleasure. Please, note that FG121 and FG141 have the same design and functionality with the only difference being the size of the grilles. 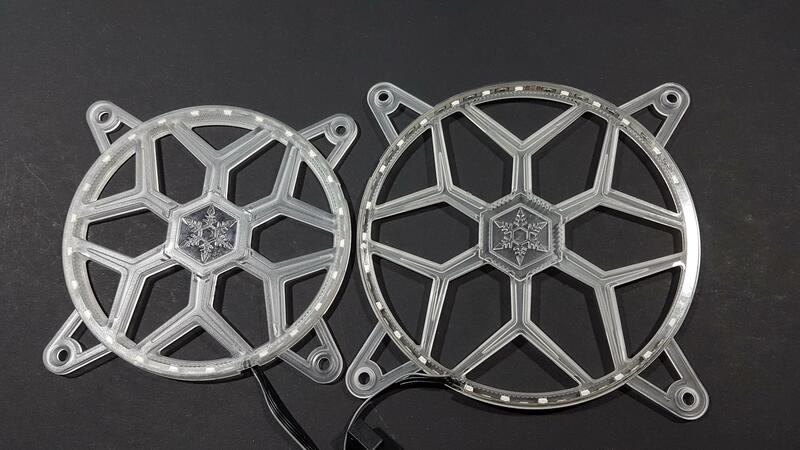 Now, let’s take a look at the FG122 and FG142 fan frames. 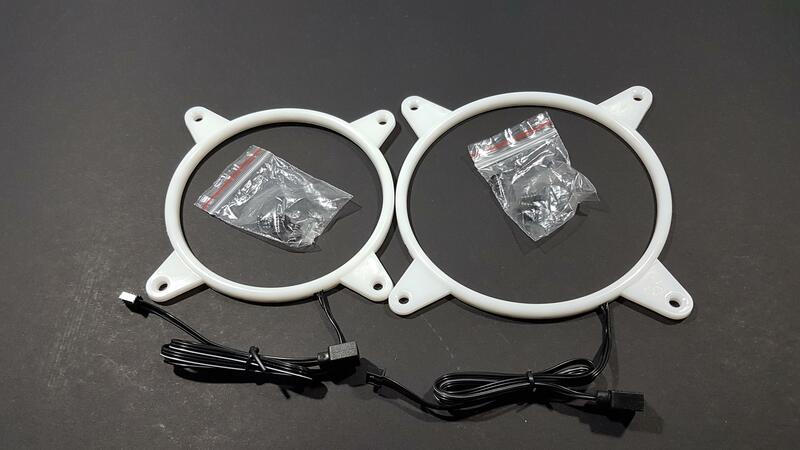 These are the fan frames, not the grilles. Here is what the SilverStone Technology has to say about them, “To meet the rising demand from enthusiasts with keen sense of style and expressive personality, SilverStone created the FG122, a 120mm fan frame with 24 integrated addressable RGB LEDs which allows for control of each individual LED to display colors independently for nearly unlimited combination of colors and gradients. This brilliant kit can be controlled by hardware or software signals such as RGB LED control box or motherboard. 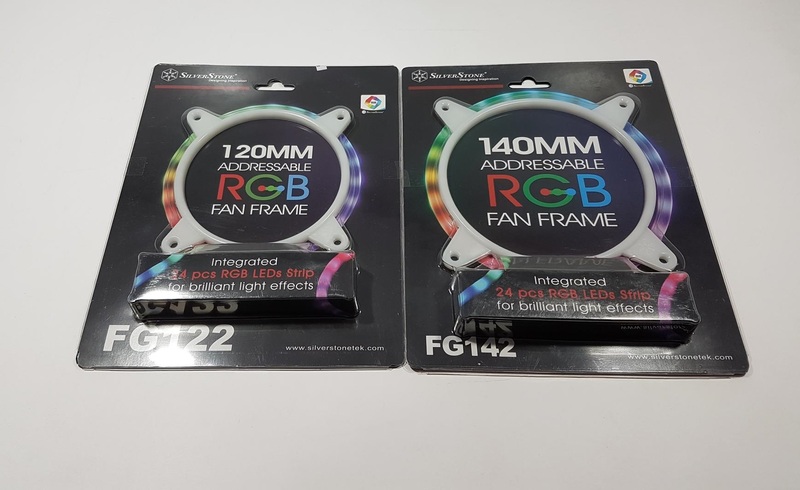 With the FG122, any 120mm fan or fan mount can be turned into an RGB display source so users can freely choose the exact fan they want to use without being constrained by the limited number of RGB fan models.” The frames are made of plastic material and in a circle shape. They are frosted to add vivid lighting effects. Their dimension is 120mm (W) x 120mm (H) x 6mm (D) for the FG122 and 140mm (W) x 140mm (H) x 6mm (D) for the FG142. They draw +5VDC and 1A each. They are following the +5, D, G and +5, D, NP, G pin definition. Take a special note not to connect these to the +12VDC source else they would end up fried. 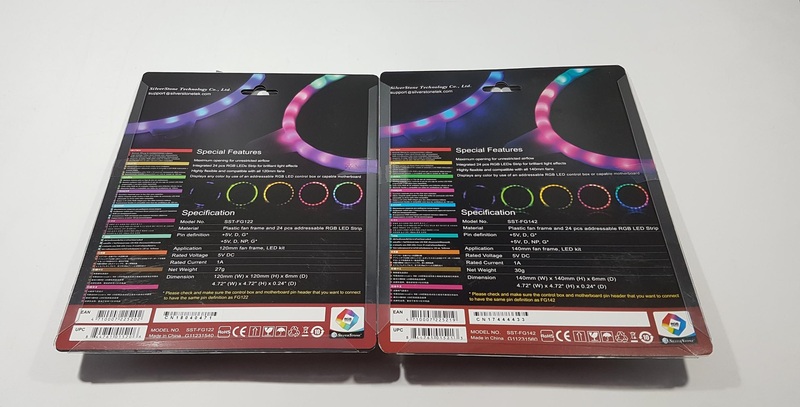 The SilverStone Technology’s LSB01 RGB LED Hub is not compatible with the FG122 and FG142. 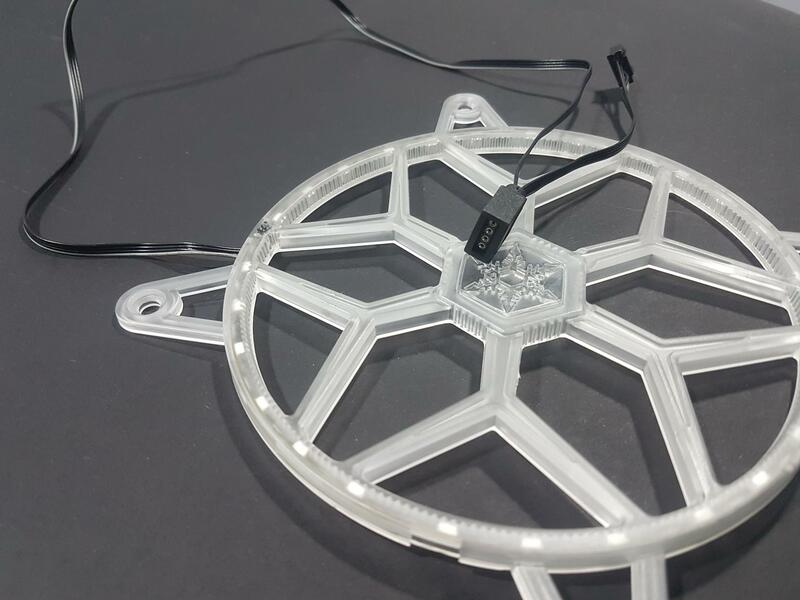 They are releasing the LSB02 RGB LED Hub which would be compatible with these frames. Each mounting corner has solid design without any open-ended design, unlike the FG121/FG141. As they are using the addressable RGB LED strips so say hello to the Rainbow effect. The mounting holes are not threaded and screws would pass through them to be screwed in the threaded holes on the fans. The corner closer to the 3-pin cable has a SilverStone Technology’s brand logo embossed on it. The backside shows a black color cover on the RGB LED strip. This is to avoid light spill over. 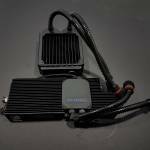 SilverStone Technology has not overlooked any aspect of the design aspect. The 3-pin flat cable has a length of 480mm+103mm. Make sure to use the motherboard’s light header that has same pin definition as is on the FG122 and FG142. We have tested these frames using the Asus ROG Maximus X Hero motherboard which has one addressable Aura header following the +12, D, NP, G pin definition. Make sure to use the latest version of the Aura software so that addressable header can be utilized. The lighting effects are sublime and they were responding to the changes in the Aura software perfectly. Here is a demo video of the FG142. Please, make a note that FG122 and FG142 have a same design and functionality with the only difference being the size of the frames. 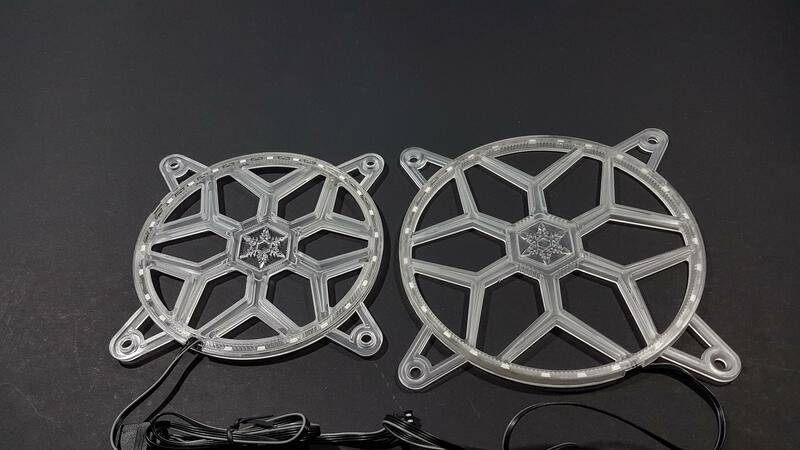 The FG121 and FG141 are the RGB LED grilles for the 120mm and 140mm fans respectively. They have a bold and stunning design in a transparent plastic body which would add much more to the overall looks of the build. They have 24 pcs RGB LED on their border. The LED is using the pin definition of +12V, G, R, B and is compatible with the devices using the same pin definition. 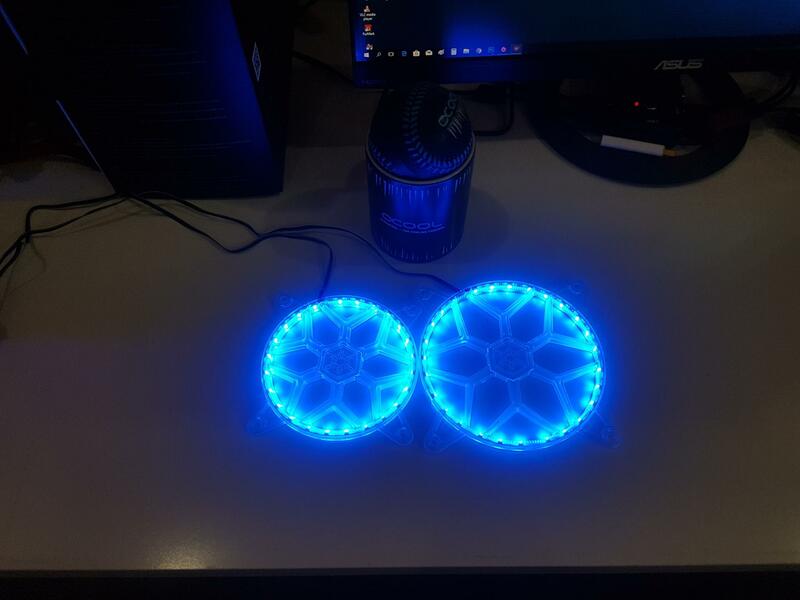 They are compatible with the SilverStone Technology’s LSB01 RGB LED Hub. Their dimension is has a dimension of 120mm (W) x 120mm (H) x 6mm for the FG121 and (D) / 140mm (W) x 140mm (H) x 6mm (D) for the FG141. . 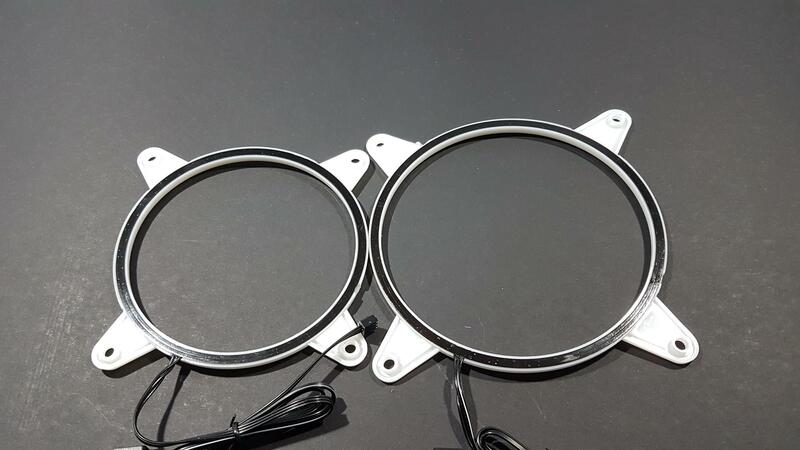 These grille take +12VDC voltage and are rated at 0.48A for the FG121 and 0.56A for the FG141 making the input power of 5.76W for the FG121 and 6.72W for the FG141. We have tested them with the LSB01 and Asus ROG Maximus X Hero’s Aura header. The lighting effects are vivid, stunning and very pleasant in person. They carry one year warranty from the SilverStone Technology though warranty period and coverage varies from region to region. 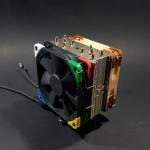 We have tested the grilles on the Alphacool Eiswolf cooling the Nvidia GeForce GTX 1080 FE to see if they restrict airflow and by what extent. The maximum temperature while playing BattleField 1 on the 4k resolution at Ultra settings without the grilles were 55°C whereas they were 55.5°C with the grilles. This is marginal and we can say that these grilles don’t restrict the airflow. These grilles not only add some sublime looks with vivid lighting but also the safety to the fans. 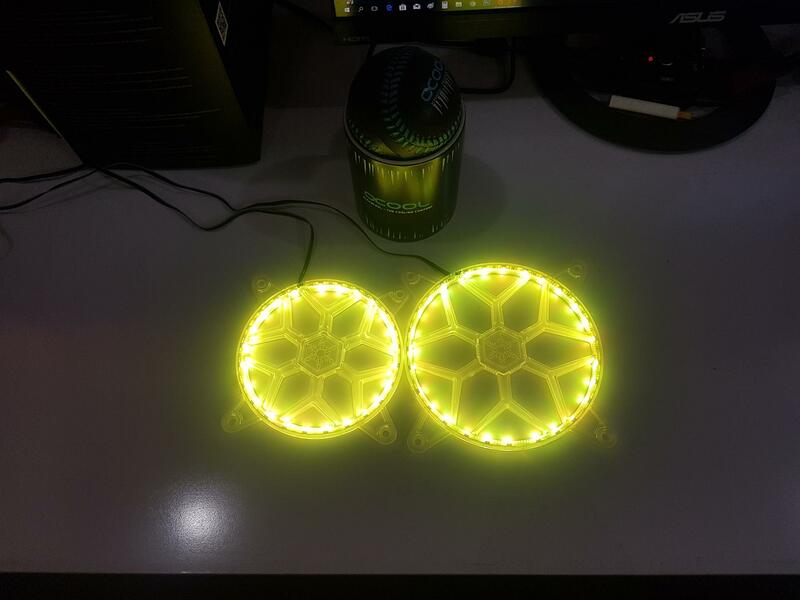 The FG122 and FG142 are the addressable RGB LED fan frames compatible with any 120mm and 140mm fans respectively. 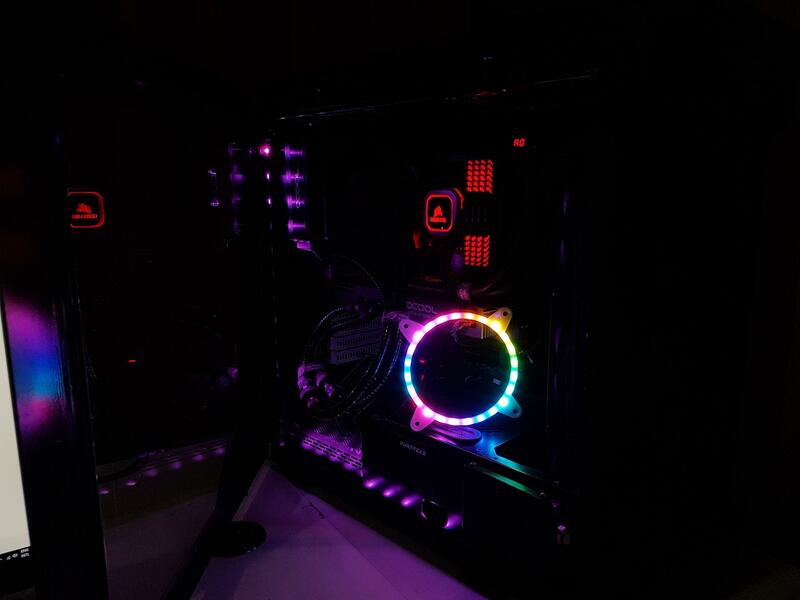 As they are using the addressable RGB LED strips say hello to the rainbow effect on them. Triggered? (pun intended). Their dimension is 120mm (W) x 120mm (H) x 6mm (D) for the FG122 and 140mm (W) x 140mm (H) x 6mm (D) for the FG142. They draw +5VDC and 1A each. They are following the +5, D, G and +5, D, NP, G pin definition. Take a special note not to connect these on the +12VDC source else they would end up fried. The SilverStone Technology’s LSB01 RGB LED Hub is not compatible with the FG122 and FG142. 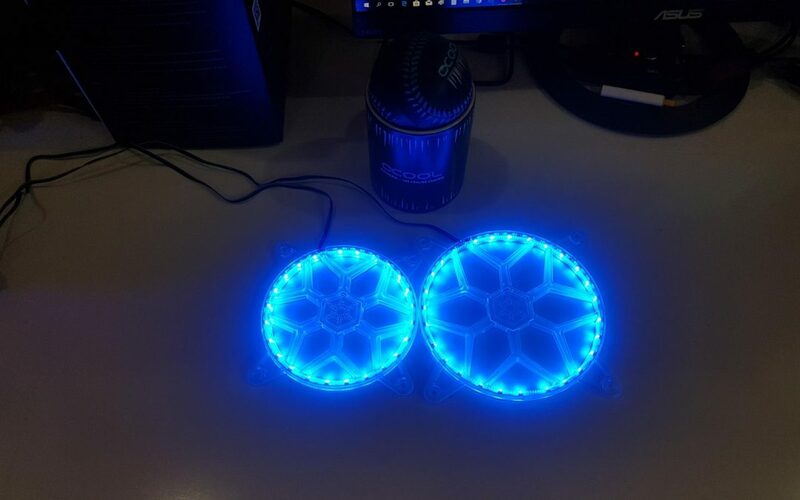 They are releasing the LSB02 RGB LED Hub which would be compatible with these frames. The LED lighting effect is dope on these and we absolutely love them. They carry one year warranty from the SilverStone Technology though warranty period and coverage varies from region to region. The FG121 and FG141 are listed at $13.28 at the time of the review. The FG122 is listed at $18.99 and FG142 is listed at $19.99 at the time of the review. Expensive, some would say! 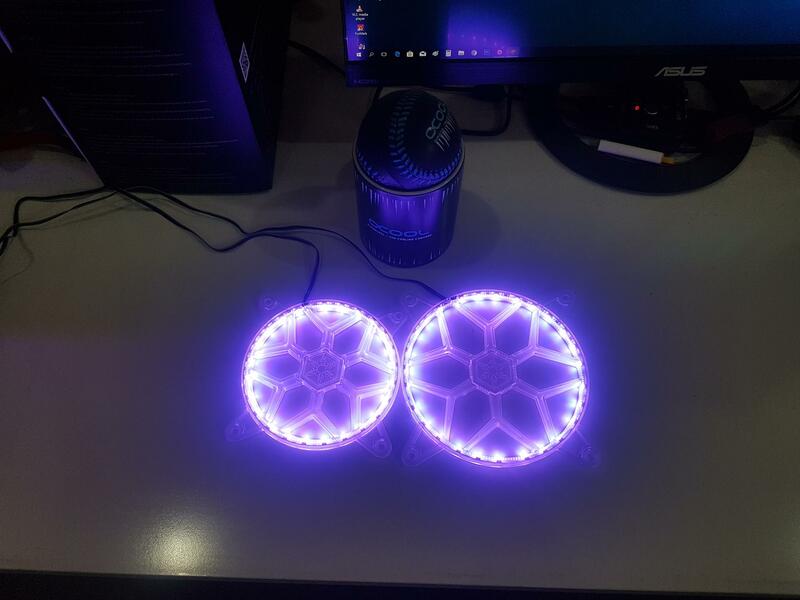 Yes, they are but given their bold design, stunning RGB lighting effect, good build quality, they are definitely a good buy and come recommended by us. 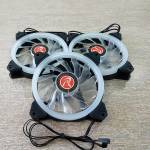 We are thankful to the SilverStone Technology for sending us the FG121, FG141, FG122, and FG142 for the review.